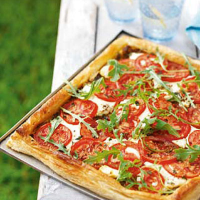 Enjoy the light, soft texture of ewe’s milk cheese, combined with ripe English tomatoes and rocket, in this easy-to-make summer tart. Preheat the oven to 200C, gas mark 6. Roll out the pastry to a 22cm x 30cm oblong and place on a large, greased baking sheet. Lightly score a line about 2cm in from the edge of the pastry. This will form a lip around the tart as the pastry is cooking. Spread the pesto evenly over the inner square of the pastry. Place the cheese slices on top, then add the tomato slices in an even layer. Scatter with the thyme, and season with freshly ground black pepper. Place in the oven and cook for 25-30 minutes until the pastry is well risen, golden and cooked underneath. Pile the rocket onto the tart. Serve immediately with a salad of lightly cooked asparagus tips, green beans and baby spinach leaves, dressed with a little balsamic vinegar and topped with Parmigiano Reggiano shavings. Other cheeses, such as firm goat’s cheese or mozzarella, would work well in this recipe, or try vegetables, such as peppers or aubergines, instead of tomatoes. With its citrus and almond notes, organic Italian bianco is a fresh, dry white wine, ideal for this dish.